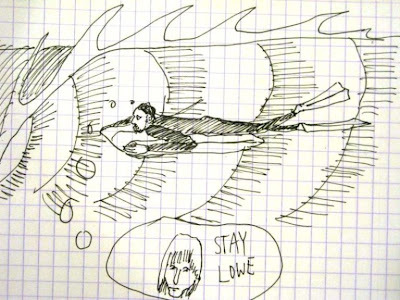 Thought you'd get a laugh out of this sketch I drew to explain to my wife Lesley what I'd been doing all day on Saturday. Ryan and I were trying to channel the G.G. riding position -- staying super low and still and positioning ourselves for maximum speed in good waves. The learning happens at a faster rate -- as we found Ryan is utilising the skills he developed riding his Liddle to position himself on the wave. I'm listening/watching and having too much fun to slow down. My ankles want a divorce. I've been involved with art directing a history book for the Santa Barbara Yacht Club for aeons now; someday it will be published. One of the great pleasures of the project is getting to pore over piles of old photos of the Santa Barbara harbor area, in great detail. Yesterday I came across this one and my eye immediately went to the kid with the mat. 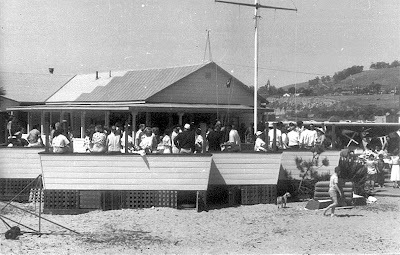 This was shot in 1950, at the start of the racing season, the first year that the clubhouse was sited in its present location in the corner of the harbor, at the base of the breakwater. I don't know who the boy is, but he's more or less one of George Greenough's contemporaries. I wonder if they knew each other? When GG moved away from Santa Barbara he left a handsome collection of his family's photos with the SB Maritime Museum, and a selection of them will find a place in the SBYC book. 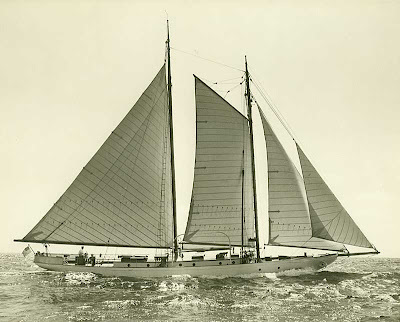 The finest of them were breathtaking original Walter Collinge prints of glorious old sailboats underweigh in the local waters.